NOTICE: In the event of a postal delivery interruption, the Peterborough Police Service will hold all completed police checks at the Records Management Unit for personal pickup for the duration of the interruption. 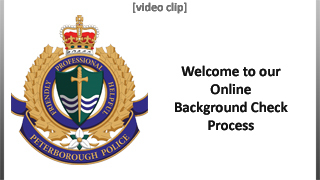 Welcome to the Peterborough Police Service's new online process for those needing a police record check for volunteer or employment purposes. This system allows you to apply for a police record check 24 hours a day without having to attend our Station. All aspects of the process - including verification of your identification, and fee payment - are handled electronically. If there are no concerns or follow-up required, documents will be available for pick up at the main floor counter at 500 Water Street 24 hours per day, 7 days a week. The police record documents cannot be picked up by anyone else and you will be required to prove your identity with valid government issued photo identification. We will not give the results to any third-parties (individuals or organizations or employers) under any circumstances. Please note, to get a Police Record Check completed, you must be a resident of the City of Peterborough, Cavan Monaghan Township or the Village of Lakefield. There are three levels of police record checks. The type of position you are applying for will determine which type of check you will require. In all cases you should consult with the agency, organization or employer that requires you to obtain a police check to determine which one is needed. The Peterborough Police Service requires all Adoption applicants submit a Police Criminal Record and Judicial Matters Check (PCRJMC). Applicants may also be required to provide fingerprints to complete the record check depending on the requirements of the adoption agency. The Peterborough Police Service charges a fee of $30.00 plus HST for cost recovery of the equipment and staffing resources required to take and process civil fingerprints. The RCMP also charges a fee of $25.00 for this comparison. Any fees associated with fingerprinting will be paid at the time you attend to have your prints taken at 500 Water Street, on Monday, Tuesday, Wednesday and Thursday mornings from 8:30 a.m. to 11:00 a.m. and on Thursday afternoons from 1:00 p.m. to 3:45 p.m. at the Records Management Unit on the 2nd floor. A police record check is current as of the date it is completed. It is your employer/prospective employer or organization's function to determine if the record check is current enough to be accepted for the position applied for. The Peterborough Police Services Board, its officers, agents and employees, shall have no responsibility or obligation to make such a determination. Intended for applicants who are involved as a volunteer, employee or in any situation where a basic PCRC is requested (i.e., retail or immigration).